The only good thing about winter in my opinion has to be the fashion. I think everyone dresses better in winter. Men's winter fashion is always better then summer - I think anyways. I love coats and boots. I was looking at Fall 2017 Mens wear collections and pulled out some of my favourite looks from my favourite designers. Mainstream brands take inspiration from these and thats what creates a fashion trend. 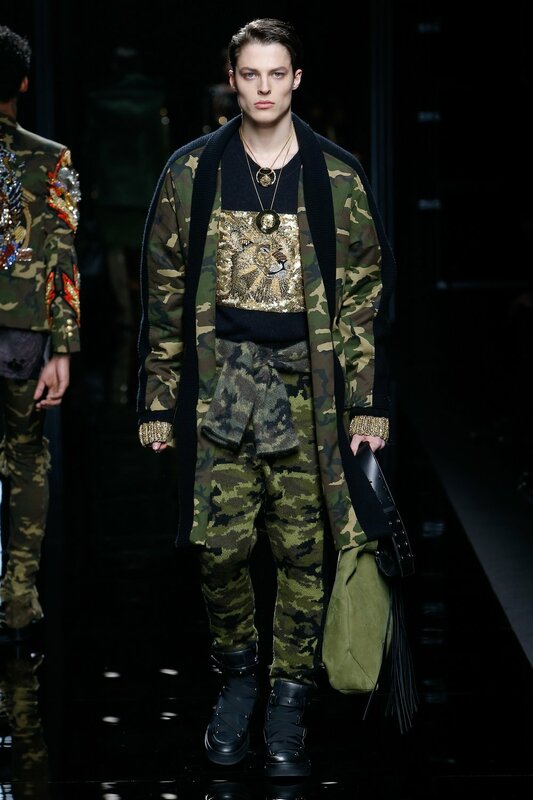 Balmain did a lot of green and army print so thats why we are seeing it in stores now. Givenchy and Gucci did sneakers with suits teamed up with a hoodie or puffer jacket and thats why we are seeing a lot of sneakers and tracksuits for street wear. Sneakers have become bigger then ever with more of a dressier sneaker being worn. The trend is all about mixing formal and casual, street wear with high end. I love it. Winter hair trends for this year are a similar concept - mixing polished with texture. So its about keeping the sides super neat and sharp with either a fade or a nice clean number two and having lots of movement and natural texture on the top. Staying away from products that give shine and using matt natural looking products like the Layrite Super Hold Cement or just using my new personal favourite Layrite Grooming Spray and blow-drying that in. Jake, Jarred and myself have been doing lots of this in the barber shop and our clients are loving it. I've always loved hair that looks "worn in" meaning hair that has texture and movement thats effortless just like all the trends that winter has. Below are some images of what I loved from Fall Mens Wear 2017. Givenchy - Sneakers, suit and jacket. Balmain- men's green street wear.